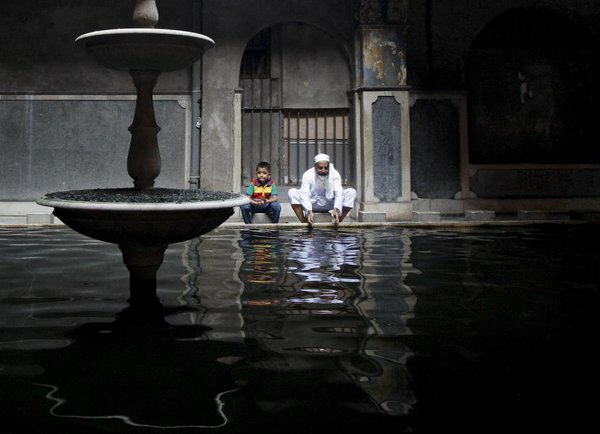 "I saw 'Uthman bin 'Affan, may Allah be pleased with him, performing ablution (wudu'). He poured water on his hands three times and washed them, then he rinsed his mouth and his nose, then he washed his face three times, then he washed his right arm to the elbow three times, then the left likewise. Then he wiped his head, then he washed his right foot three times, then the left likewise. Then he said: 'I saw the Messenger of Allah (Peace Be upon Him) performing wudu' like I have just done. Then he said: 'Whoever performs wudu' as I have done, then prays two rak'ahs without letting his thoughts wander; his previous sins will be forgiven." Let’s make sure to maintain this beautiful act of sunnah, hopefully it will be a reason for us to attain Allah’s mercy and enter Paradise.